The Intel Security Group is a division of Intel Corporation dedicated to the research and development of security software. The security group was formed after the acquisition of McAfee in 2011 with the goal of creating powerful antivirus products based on their original antivirus engine. Today, Intel Corporation owns and operates the Intel Security Group out of Santa Clara, California. As of 2014 they've decided to begin their rebranding of the McAfee product line into Intel Security. Pros: One of the easiest to use, install and manage. Above average detection rates and real time protection. Cons: Above average price compared to competitors. Uses more system resources than other antivirus packages. Intel Security's AntiVirus Plus - Includes antivirus protection along with browser protection, automatic scanning, real-time protection, online privacy and financial protection along with limited online backup capabilities for 1 PC. Intel Security's Internet Security - Antivirus protection along with browser protection, automatic scanning, real-time protection, online privacy and financial protection along with limited online backup capabilities, PC optimization tools, parental controls, e-mail and spam blocking for up to 3 PCs. Intel Security's Total Protection - Antivirus protection along with browser protection, automatic scanning, real-time protection, online privacy and financial protection along with limited online backup capabilities, PC optimization tools, parental controls, e-mail and spam blocking, hacker and thieve firewall protection and social media link protection for up to 3 computers. Intel Security's McAfee antivirus package is definitely one of the easiest software packages to use in the market. 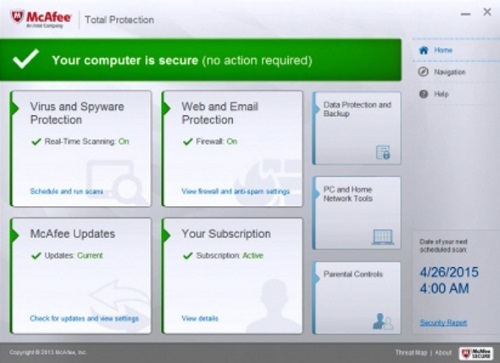 If you have any experience whatsoever with antivirus products the dashboard will be intuitive and user friendly. It's extremely easy to find and setup just about any feature included with the software package. What's especially helpful is how easy it is to configure parental controls for all of the family members at your home. Also, if users want to do advanced customizations or setup they can easily do so by digging a bit through each category. 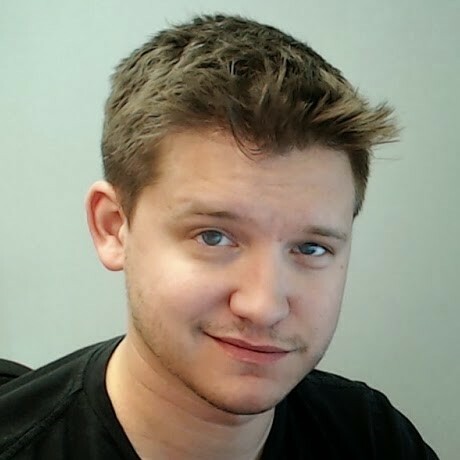 This includes advanced firewall exceptions for applications or ports on your computer. The Intel Security antivirus package included in McAfee Antivirus Plus, McAfee Internet Security and McAfee Total Protection came in near first place for virus file detection scans. These scans essentially make sure there currently are not viruses installed on your computer. For real time protection Intel Security's also came back with a solid, average, score compared to other competitors. 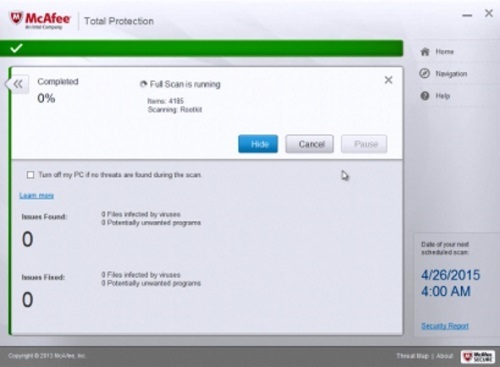 This, combined with the higher file detection rates, makes it a very competitive option for reliable virus protection. On the performance end of things Intel Security's McAfee product may not be the most efficient in the market, but given the amount of protection it provides, it's not too much of a concern. In many cases it's understandable to have an antivirus package use more resources if it provides better detection rates. Intel Security's product is also one of the best supported products in the market. They offer a comprehensive McAfee support website dedicated to frequently asked questions as well as a thorough knowledgebase of information. Intel Security's users can also contact them through the online chat system, by telephone or if they have a very specific need, purchase various support packages. These premium support options can range from software installation to advanced virus removal support. Intel Security's product options may be priced higher than their competitors but they certainly offer great packages for the price. Once upon a time McAfee was notorious for inadequate protection and bundled packages that cause user frustration, it appears Intel Security is successfully changing that image. Of course, another value added is that some of the packages will protect up to three computers for one price. On top of that, users can take advantage of the 30 day money back guarantee. This should allow users enough time to decide whether or not the Intel Security McAfee product is right for them. A great antivirus package at a reasonable price. I'm particularly happy to see Intel Security changing both the image of McAfee along with enhancing the overall capabilities of the software. I can honestly recommend Intel Security McAfee as a great option for virus protection. If you are in the market for a user friendly comprehensive antivirus package with great features then Intel Security’s McAfee is definitely one of the options you should consider. It is also great to see parental control options at their mid-grade packages.